Don't miss out though - the sale runs from 26th December 2010 to 9th January 2011. Browse the Archive CD Books Britain and Ireland shop now. The Guild is thought to be unique among genealogical organisations in providing a UK telephone helpdesk to which calls can be made completely free of charge from all UK landlines. Available for seven days a week, 365 days a year, it provides a much-appreciated service for the use of both the general public and members of the Guild. Launched in early 2005, the helpdesk Freephone number 0800 011 2182 has now become familiar to most of our members, appearing on the front page of the Guild’s website and in all of its publicity material. Earlier this year, the toll-free number 1 800 647 4100 was launched to provide both the public and Guild members throughout North America, with direct access to the Guild helpdesk and is proving to be equally successful. North- American number is currently being answered in America during the day (US time zones) and in the UK at other times. The Guild have now introduced a free phone number in Australia - 1800 305 184 which is being answered in Australia during the day (Australia time zones) and in the UK at other times. This project funded by the Arts and Humanities Research Council and combining the Universities of Glasgow, Edinburgh and King's College London, has investigated how a recognisably modern Scottish identity was formed during the period 1093-1286. Drawing on over 6000 contemporary charters, it constructed a unique data-base which will provide biographical information about all known people in Scotland between 1093 and 1286. This data-base is freely available to all. The National Library of Scotland has a new dedicated Post Office Directories page on its website at www.nls.uk/family-history/directories/post-office. There are 287 directories currently available from 1774-1911, about a third of those digitised for the Internet Archive project, with the rest soon to follow. At the moment they can be browsed or downloaded in PDF format only - a new search facility will follow later in 2011, with each name indexed by the first three letters on each page (i.e. PAT for PATON, PATERSON etc). There will be a Discovering Family History Workshop on January 10th at 2.00pm, at George IV Bridge, Edinburgh.For more see www.nls.uk/events/readers-workshops#genealogy. There will also be a Building the Bell Rock Lighthouse Treasures Display from January 12th - February 28th 2011 at George IV Bridge, Edinburgh. See www.nls.uk/exhibitions/treasures#bell. Finally, 18,000 Scottish maps from the library's online collection have also now been made available at the ScotlandsPlaces website at http://www.scotlandsplaces.gov.uk/. Merry Christmas to new friends and old - and see you on the other side! The Scottish Military Research Group has made available online the first part of its Glasgow Roll of Honour, covering surnames beginning A-D, with some 4500 names in total. When complete the whole roll will contain some 18,500 names. Much of the work was compiled by the group's Kevin O'Neill, who sadly passed away in November, and to whom the project is now dedicated. The UK branch of Ancestry has launched a new Help and Advice Centre at www.ancestry.co.uk/cs/HelpAndAdvice. The European Union (EU) has officially granted state aid clearance to the Shetland Islands Council (SIC) for homes and businesses on the islands to benefit from a new fibre optic broadband cable link with mainland Scotland (UK). The Shetland Fibre Optic Network (SFON) project will, in total, cost roughly £1.1 million to complete but could significantly improve broadband ISP connections for island residents. Until now only the Faroe Islands have been able to benefit from the original 2007 laid cable after BT refused to extend it. According to the Shetland Times, a fibre optic cable running between Lerwick and Hoswick is now expected to be completed before summer 2011; work to hook up the other towns will commence later in the year. It was revealed in September 2010 (here) that £367,500 of the total was to come from the European Regional Development Fund (ERDF). Hopefully that's good news for Scotland's Nordic genies...! The ScotlandsPeople Centre (www.scotlandspeoplehub.gov.uk) offers gift vouchers for sale at £10 each for a full day's search pass, with no expiry date by which they must be used. From April 1st the admission price to the centre will rise to £15. I've just been on the phone to the centre to book a seat for some research. Curious to know whether the purchase of a voucher at £10 would be valid for admission after April 1st, when it should be £15, I asked the question, and the person on the phone offered to call me back with a definitive answer. He duly did so a few minutes later - and it appears that, as things stand at the moment, a voucher purchased at £10 is in fact valid for a full day's research after April 1st, and not just £10 off the admission price. If you are planning on lots of visits in the next few months, the vouchers may well be a useful way to try to save money on admission costs - though it is entirely possible that the situation will be changed in due course, so ask before you buy! For the National Archives of Scotland (www.nas.gov.uk), General Register House's search rooms will close on Friday 24 December 2010 at 15.00 and re-open again at 09.00 Wednesday 29th December 2010. They will then close at 15.00 on Friday 31 December 2010 and re-open at 09.00 on 5 January 2011. West Register House will close on Friday 24 December 2010 at 15.00 and will not re-open again until 09.00 on 5 January 2011. Debra Chatfield, Marketing Manager at findmypast.co.uk, said: "Start Your Family Tree Week will help people make the most of Christmas family gatherings to pass on their family memories across the generations, and to share in brand new discoveries by using online family history resources. The internet has made it so much easier to trace your family tree and learn about your family's own unique story, full of colourful, real-life characters from the past. Every family has its intrigues, well-kept secrets and heart-warming tales, and I believe we could soon see family history becoming the traditional Christmas pastime for all the family." Rhoda Breakell, head of Genes Reunited, comments: "Grannies sinking sherries, dads taking an afternoon nap and siblings squabbling is a typical Christmas Day for most, but it makes you wonder whether your family has always been like that. With this year's yuletide festivities just around the corner it's a great time for you to think about your family's roots. Start Your Family Tree Week is an ideal time to start exploring your family history, whether it's tracing great-grandparents' names, searching military records or even discovering that you have a famous sportsperson in your gene pool, the resources and offers available from 26th December will make it an easy and fun journey." has become a gateway to the future for many it is also an amazingly powerful tool for uncovering the past and reconnecting people in ways that were once unimaginable. Christmas is the perfect time for families to explore their history and encourage older relatives to go online for the first time - I hope that this initiative is a great success and urge everyone to get involved." The London based Society of Genealogists (www.sog.org.uk), which hosts a great many Scottish resources, will be closed from 4pm Thursday 23rd December 2010 to 10am 29th December 2010, and again from 4pm Thursday 30 December 2010 to 10am Tuesday 11 January 2011. Congratulations to Elizabeth Roads on being appointed Scotland's first ever female herald, having worked at the Court of the Lord Lyon since 1975. Elizabeth very kindly proof read the chapter on heraldry in my book Researching Scottish Family History earlier this year, and kept me straight on a few points! It's silly season with the historians again. Apparently Irvine may have been the ancient capital of Scotland, because it sounds a bit like Evonium, cited by Boece in the 15th century - or something like that. For more on the nonsense, see http://news.scotsman.com/news/Stone-of-Destiny-39from-Ayrshire.6665396.jp. My son will be delighted though, as he was born there - my liege! John Swinney, Cabinet Secretary for Finance and Sustainable Growth announced last week that the National Archives of Scotland (NAS) and the General Register Office for Scotland (GROS) will merge. This follows an options appraisal by officials of the two organisations and Registers of Scotland, which looked at different combinations of amalgamation between the three. The NAS-GROS merger builds on existing close working relationships between the two bodies, particularly the service for family history under the highly successful ScotlandsPeople brand. This grew from the idea that the public understood little and cared less about organisational differences; what they wanted was access to information through one portal. Merger will allow further integration and improvement of public services. Combining resources will create a stronger organisation with wide skills in acquiring, processing and making available records and information. NAS will benefit from access to GROS expertise in geographic exploitation of data, GROS will benefit from NAS expertise in long term preservation of both digital and paper records. There will also be further sharing of central services, building on the existing close working that already covers accommodation services, training and development, records conservation, records management and library services. The existing record keeping functions of NAS and the registration and statistical functions of GROS will continue. Staff of both bodies are part of the Scottish Government main bargaining unit and there will be no change to their terms and conditions as a result of the merger. No date has been set for completing the merger, but work is already underway to share finance services, and detailed work in other areas will begin shortly. NAS and GROS have also agreed with Registers of Scotland to develop a programme of joint working which is likely to include greater data sharing and co-operation in long term digital preservation. The BBC has a news page showing a series of images depicting Scottish landscape changes over many years. Visit http://www.bbc.co.uk/news/magazine-12019593 and use the slider to flit between the pairs of images for then and now. Once again the economic downturn has claimed another Scottish genealogical victim, this time in the form of a freeze on the development of the Am Baile website (www.ambaile.org.uk) from April 2011. Am Baile is truly one of Scotland's genealogical gems, a key resource for those with Highland ancestry, not least of which for the newspaper indexes on the site. This is a real, crying shame. Government funding is being cut left, right and centre. At least they haven't proposed a cull of the population yet, but at the rate at which things are going, anything seems possible! The report announcing the decision to cut Am Baile funding is on p.13 at www.highland.gov.uk/NR/rdonlyres/B3461796-F5FE-4661-A00B-439F0D9AC757/0/Item16bBookletB.pdf. Up for a Scots/Irish genealogy cruise around New Zealand?! Australian gene genie Unlock the Past has announced a provisional confirmed programme of genealogical events for next year, but wants you help to firm up some further suggestions. Amongst those ideas still to be confirmed is a 14 day Scots/Irish themed cruise around New Zealand in November, which yours truly has agreed to participate at for the Scottish side of things, if it goes ahead. Two Irish experts have also agreed to participate, but I won't name them until Unlock the Past does - suffice to say for now that they will not disappoint! Further suggestions up for grabs include further expos in Northern Queensland, Geelong, Western Australia and Mid Northern New South Wales, as well as a writing local and family history seminar in Adelaide. The Cregagh self service facility will be closing early at 5pm on Thursday 23 December 2010. There will be no late opening for that evening. Cregagh will be open for normal service from Tuesday 4 January onwards. The German National Library, Oxford University and Europeana have signed an agreement to digitise family papers and memorabilia from the First World War to create an online archive about the people involved in the conflict. Oxford University began the initiative when it asked people across Britain to bring family letters, photographs and keepsakes from the War to be digitised. The success of the idea – which became the Great War Archive – has encouraged Europeana, Europe’s digital archive, library and museum, to bring the German National Library into an alliance with Oxford University to roll out the scheme in Germany. The collaboration will bring German soldiers’ stories online alongside their British counterparts in a 1914-18 archive. There will be a series of roadshows in libraries around Germany that will invite people to bring documents and artefacts from family members involved in the First World War to be digitised by mobile scanning units, and to tell the stories that go with them. There will also be a website allowing people to submit material online if they are unable to attend the local events. Everything submitted will also be available through Europeana, where it will add a new perspective to collections of First World War material from institutions across Europe. COMMENT: I think this is a simply brilliant development. About 14 years ago I had the task as a young BBC researcher to sit in the Imperial War Museum in London and to listen to recordings of many of those who fought in the First World War for a possible programme development. I always remember the most powerful testimony being that of a former German soldier telling the interviewer how he desperately wished the war would end in 1918, as he and his family were starving and desperate. There are two sides to every conflict, and it will be great to hear that of the other side in such detail. I'm sorry the government thinks the good folk of Ulster are made of money. It's not as if the province is sharing a land border with Europe's fastest sinking economy and in serious risk of economic contagion or anything! Having previously appeared in the UK version of Who Do You Think You Are?, actress Kim Cattrall has now been signed up as one of the celebrities to take part in the next American version of the series. I think someone has got the geen genie bug here...! In the UK version Cattrall discovered that her grandfather was a bigamist. Hopefully in the US version we won't end up with a five minute end sequence of Cattrall shouting out "I'm an American!" (with apologies to Sarah JP!) - I'm guessing the audience will get that already! The new incarnation of the Mormons' FamilySearch website, for several months available in a beta version, has now been migrated to the previous version's address at www.familysearch.org. It's not quite the end of its predecessor, which will continue to be made available at www.familysearch.org/eng/default.asp for a while longer - but we're now very nearly at the end of an auld song. • An improved search experience that looks through more content and gives more accurate results. • A thriving online genealogical community where patrons can give and receive help. An exhibtion is currently underway at Carnoustie Library to commemorate the 142 people from the town who lost their lives in the First World War, including two Victoria Cross recipients. Maureen Fleming of the library has compiled a new roll of honour for those who fell. The next edition of the popular Family and Local History Handbook, volume 13, will be made available at the Who Do You Think You Are? Live show at London's Olympia from February 25th-27th. Produced by Robert Blatchford Publishing Limited (www.genealogical.co.uk), the book is both a yellow pages type guide for details of all archives, family history societies and more that you may ever require for your research, as well as a superb volume packed with articles on all aspects of British and Irish family history - you might even find one or two in there from yours truly! I'll be having the great pleasure to help both Bob and Liz Blatchford on their stall again at the event for the three days - if you're a regular blog reader please do pop over and say hi if you're going! In the meantime, you can still purchase the previous editions of the book from www.genealogical.co.uk - Volumes 11 and 12 are still in print, whilst Volumes 1-10 are reproduced in PDF format on a CD. Thanks to the US based Family Tree Magazine for including the Scottish GENES blog in the top 40 blogs 2011 shortlist, and congratulations to all fellow nominees! To view all those listed, and to vote for all your favourite blogs, visit http://blog.familytreemagazine.com/insider/2010/12/13/HelpChooseThe2011FamilyTree40.aspx and http://www.surveymonkey.com/s/ft40-2011voting - the results will be announced in July 2011, and voting closes on 20th December. Access to plans reference RHP1-5999, 17800-18771, 18790-19999, 20001-75000, 80000-89195, 89365-95510, 97819-97828, 98401, 98405-98466, 140073-142427 & IRS101-133 will be closed for a period of four months from Monday 22 November 2010 to allow for plans’ storage to be upgraded. We apologise for any inconvenience this may cause, but hope that you will understand that we are committed to maintaining preservation standards for our national collection. Library and Archives Canada (www.collectionscanada.gc.ca) has announced that it is to significantly expand its digital collections access by 2017, in time for the country's 150th anniverary of Confederation. Within a year it will double the amount of digitised material it makes available, provide the option to purchase digital images from its collections and significantly expand what it makes available through Ancestry.ca. Genes Reunited (www.genesreunited.com) has joined the latest frenzy over the 1911 census, following Ancestry's release of census summary books - GR has released original household images to go with the transcriptions already made available. Ancestry (www.ancestry.co.uk) has uploaded the 1911 census summary books for England, Wales, Channel Islands and the Isle of Man. 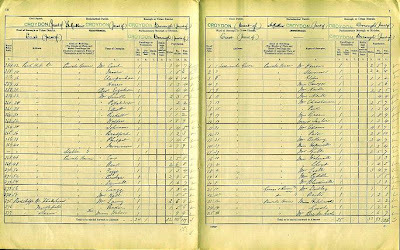 These are NOT the full census returns, however - they are coming very soon - but one of the additional pages following the household schedules, which lists the heads of household only, and information about the properties enumerated. Useful information in its own right, though sadly not as useful as the Irish 1911 census equivalent which lists landlords' names also, and which can tell you if your ancestor actually owned the property he occupied etc. Whilst the books are online, the descriptor for each collection on the respective search screens seems to be providing information for the actual forthcoming household schedules, and not the enumerators' returns. I've had a quick play, and searched for my great great uncle James Paton in Croydon - he is in fact listed as "Mr Paton", and the search only worked when I put in the surname and input Croydon into the "Registration District" field - not the "Lived In" box. An interesting addition, and good quality images from what I have seen - but not a patch on the original schedules which will be of much more use when uploaded in the next few months. Click on View All New Records on the home page to access the respective search screens. Videos from the Addressing History project's lanch day in Edinburgh a couple of weeks ago are now online at www.youtube.com/user/AddressingHistory. I attended the day's events and my summary of the proceedings is at http://scottishancestry.blogspot.com/2010/11/addressing-history-launch-report.html. Of particular interest to most genealogists will be the lecture by Ines Mayfarth on the NLS Post Office Directories digitisation and indexing project for the Internet Archive, and Nicola Osborne's and Stuart MacDonald's presentation on Addressing History itself, but there are also useful presentations on the NLS georeferncing project and the Tobar an Duachais/Kist o' Riches audio digitisation project. Since the Marketing Strategy meeting in March, the Guild has been liaising with Familysearch to build up more links with their organisation. Those of you who are regular users of Familysearch will have seen the new beta.familysearch.org site and 2010 Conference attendees will remember that we were informed that the site would be completely re-launched ‘in due course’ with all the data on one site, as well as the IGI (with members submitted data separately). Familysearch are keen for their work to benefit the worldwide family history community as much as possible and, to this end, we have set up a link with them. Anyone who searches their website for a surname registered with the Guild will be presented with a link to the Guild website and your contact details! There will be an opt-out facility if you do not wish your details to be made available in this way. The link is due to ‘go live’ in February – look out for more details in January JOONS and hopefully many more contacts as a result! Familysearch are also in the process of converting all their genealogical and historical records from around the world into digital images which are stored in their online system. They plan to give everyone free access to these indexes through their website. Our volunteers coordinator, Glenys Marriott has agreed to coordinate an indexing project on behalf of the Guild. This project will be a closed project in which we can select the records we want to transcribe, at a county and record level (e.g. Yorkshire marriages post-1837, not in the IGI). These records will be completed solely by the Guild volunteers and we will then receive a copy of the images and index for our archives. This was the first course to be offered and was first run in 2009. It is a five-week course, covering the history of one-name studies, reasons why genealogists should have a one-name study, how to check on the suitability of your surname, the history and distribution of surnames, the practical aspects of running a one-name study, and the collection and analysis of data from core records needed for a one-name study. This introductory course has proved very popular. The next five week course starts on the 20th January 2011 - see the Pharos website for the next offering of the course. Students who complete the Introduction course, or who already have a registered name with the Guild of One-Name Studies and a large amount of surname data, can also take advantage of the latest course Advanced One-Name Studies. This intensive course looks at studies in the light of analysis and synthesis of findings with an optional assessed element. The course runs for six weeks starting on the 23rd May 2011. I know for a fact that the one name courses are very quickly booked out, being so popular, so if interested, I humbly suggest you get in like Flynn! The National Trust for Scotland has opened the doors to its £21m Robert Burns Birthplace Museum (RBBM) – the first major museum to open in Scotland in three years and the bench mark against which all future Trust properties will be set. The highly anticipated opening is the culmination of years of planning and includes a 500m2 exhibition space which has four distinct areas - ‘Identity’, ‘Inspiration’, ‘Fame’ and ‘Creative Works’ - addressing every aspect of Burns’ life through an innovative and thought-provoking interpretation. Highlights from a collection of over 5,000 historical artifacts, original manuscripts and pieces of memorabilia are presented in a fresh and novel way while engaging interactive multimedia features and newly commissioned works from leading Scottish artists including Kenny Hunter, Timorous Beasties and Sue Blackwell, which are interspersed throughout the site, will engage visitors of all ages. The Robert Burns Birthplace Museum replaces what was formerly known as the Burns National Heritage Park to bring together all of the Alloway sites with a connection to Burns including the new 1,600m2 museum, the Burns Monument, Alloway Auld Kirk, Burns Cottage, an education pavilion and Auld Brig O’Doon. A new footbridge will also be created to link key sites to the new museum to make accessibility as easy as possible for visitors. Nat Edwards, director of the Robert Burns Birthplace Museum, said: “This has been a real labour of love for all involved and we’re absolutely delighted to open the doors to the new museum today. Our aim is to provide a modern and relevant interpretation of Burns that will intrigue visitors of all ages, whether they are lifelong Burns enthusiasts or completely new to his work. The museum, which is the largest, most ambitious project the National Trust for Scotland has ever undertaken, is generously supported by the Scottish Government, the Heritage Lottery Fund, Scottish Enterprise and South Ayrshire Council in addition to thousands of donors who have generously contributed to the creation of a lasting, and fitting legacy for the bard. Colin McLean, Head of the Heritage Lottery Fund in Scotland, said: “This is truly a day to celebrate Scotland’s cultural history. We can now offer the world a captivating insight into the life and works of one of our national heroes through a state-of-the-art museum which we can all be proud of. From the initial planning stages of the RBBM, the Trust was keen to ensure the Scots language would feature predominantly throughout the museum; aiming to position it as the leading museum destination for those looking to learn about the ‘mither tongue’. From Scots words engraved on the wall of the museum exterior to the descriptions of artefacts which are given in Scots in the exhibition – RBBM is the first museum to feature the language in this way. Hundreds of contractors have been involved in the museum’s build including lead designers Events Communication and builders Border Construction. From an architectural perspective, Arnaud Schwartz’s, of Simpson and Brown’s, main aim with the modern design of the new Robert Burns Birthplace Museum was to create an ecologically responsible and sustainable building that meets the needs of the present without compromising the ability to adapt to fit the needs of future generations and the museum. As such the museum has a unique sedum roof that naturally insulates the building while heating and cooling is provided by 12 earth energy ground-source heat pumps. Upon entering the exhibition area, visitors see a timeline of important dates in Burns’ life and events taking place in Scotland that would have affected his work; but that’s where the traditional museum experience ends. A theatrically lit corridor serves as the entrance to the main exhibition area and sets the scene as voices of gossips talking about Burns quietly echo through the hall while words such as ‘exciseman’, ‘lover’, ‘poet’, ‘ploughman’, ‘icon’ inscribed on the floor open visitor’s minds to the idea of Burns as a man through the different stages of his life. London based company Spiral Productions has created 17 interactive features for the new museum and has worked closely with interpretation manager Mary Stones to create unique interactive elements that complement the artifacts on show and encourage visitors to actively participate in learning about Burns. Celebrities including Bill Paterson, Brian Cox and Eddi Reader have lent their support to the museum by recording vocals for audio visual interpretations of ‘To a Mouse’, Red, Red Rose’ and ‘Tam o’ Shanter’ which are accompanied by stunning imagery to ignite imaginations and bring the pieces to life. Upon entering the main exhibition space, visitors go through the Identity section which will present Burns’ family and relationships and how these had an influence on his life and works. The section is split to focus on Burns as a brother, a friend, a lover, a husband and a father with relevant artifacts featured in each display including a fragment of his wife, Jean Armour’s wedding dress, Highland Mary’s bible and a letter to his brother William. Burns’ influences are then explored in the ‘Inspiration’ section which is segmented into five key areas – ‘nature’, ‘books and music’, ‘politics’, ‘love’ and ‘belief’. One of the highlights in this section is a tongue-in-cheek interactive news programme called ‘The Burning Issues’ presented by anchorman ‘Jeremy Waxman’ which looks at topical issues of Burns’ time. Visitors will later move onto explore Burns the songwriter with a jukebox that categorises his songs into modern day genres such as ‘floorfillers’, ‘tearjerkers and ‘power ballads’ which aims to show that Burns was as much an accomplished songwriter as he was a poet. This area also features an Auld Lang Syne interactive element which allows visitors to listen to different versions of the iconic song which have been recorded by Burns enthusiasts from around the world and uploaded to a special RBBM Facebook page before the museum opened. Visitors can then go home and upload their own renditions which will be considered for inclusion on the jukebox. It’s these modern touches that make the Robert Burns Birthplace Museum unlike anything that has ever been done before and present Burns’ work and significance in a way that will appeal to visitors of all ages and from all walks of life. Burns’ status as a global icon is explored in the ‘Fame’ section which looks at the ‘cult of Burns’ and how the fascination with Burns grew after he died. This area includes an interactive Burns Supper which encourages museum visitors to engage with each other as they learn about the way in which the bard’s birthday is celebrated around the world each January 25. Finally, in the ‘Creative’ section, Burns’ works are enclosed in listening pods where visitors can listen to his poems while many original manuscripts, including Scots Wha Hae and Auld Lang Syne will be on display for visual purposes. Part of the museum space will play host to a series of temporary interpretations with the inaugural exhibition being a major new showcase by Scottish artist Peter Howson. The exhibition, ‘Howson Burns: Revealed’, features 15 new portraits of Robert Burns which are on display and available to purchase from December 2010 – June 2011. The exhibition includes 12 pastel paintings and 3 new oil paintings of the bard which are guaranteed to spark the interest of fans of Burns and Howson alike. The BBC has created a new site dedicated to the World War 2 code-breaking statioon at Bletchley Park, which can be found at www.bbc.co.uk/history/places/bletchley_park. In June, Bletchley Park Museum announced it was digitising its entire archive over the next three years to place online, although some resources are already available on its website. To catch up on the story visit http://scottishancestry.blogspot.com/2010/06/bletchley-park-archive-to-be-digitised.html. As a special offer to RCAHMS newsletter subscribers, our two new publications Above Scotland - Cities and Victorian Scotland are available at special discount prices, including free postage and packaging. In Above Scotland - Cities the fascinating stories of the nation's dominant urban landscapes are told through 90 years of stunning aerial imagery. To order for £19.99 (RRP £25.00) with free UK P&P call BookSource on 0845 370 0067 and quote CITIES. In Victorian Scotland the pioneering work of the nation's first ever photographers mixes with rare and never-before-seen imagery from private family albums in a compelling account of the generation that changed the world. To order for £23.99 (RRP £30.00) with free UK P&P quote VICTORIAN. We are also offering a further discount if you order both books together. For a special price of £39.99 (RRP £55.00) you can buy both books with free UK P&P by quoting EXPLORE. From December, if you order an existing digital image from RCAHMS you will receive your second image half price. Select from 150,000 stunning, high quality digital images from Scotland’s architectural, industrial, archaeological and maritime heritage over the last 100 years. Click on the image of your choice and select Order Image. Your first selection costs £10 plus VAT and each subsequent image is only £5 plus VAT. Are You a Fan of RCAHMS? You can now follow RCAHMS on Facebook and Twitter. Fans and followers can keep up to date with all RCAHMS news and events, and benefit from a growing selection of interactive content. Updates of projects, exhibitions, publications and websites are posted regularly and are easy to share with colleagues, friends and family. Sorry, Google, the internet giant, has today launched its long awaited eBook store at http://books.google.com/ebooks, through which it will be possible to purchase copies of books and to source many millions of others for free. Books can be read on many different platforms, including Amazon's Kindle, Google's Android and others utilising Adobe's ebook platform. On a quick search of Scotland all sorts of free material emerged, such as "Documents and records illustrating the history of Scotland, and the transactions between the crowns of Scotland and England, preserved in the treasury of Her Majesty's Exchequer", "Memoirs of the Church of Scotland" and many other fascinaing texts. A little light bedtime reading! A new timeline site called Save Every Step at www.saveeverystep.com is proving to be a lot of fun! I am currently writing a full review of the site for a forthcoming magazine column, but in essence it allows you to create an interactive 'lifeline' which can be used as both a daily diary or to upload historic events.